Humans have been consuming wine for thousands of years. In earlier times, it was used as a beverage and also as a medicine for a variety of ailments, including digestive and heart issues. It also was an important source of calories in the diets of some factory workers early in the Industrial Age. Today, Americans are drinking wine more often than they did in the 20th century. U.S. wine consumption increased from 0.26 gallon per adult in 1934 to 2.54 gallons per adult in 2010, according to the Wine Institute. The U.S. Dietary Guidelines for Americans (2010) recommends moderate consumption. “Tree Fruit Culture and Varieties in North Dakota” (H327). This publication includes information about growing apples, cherries, plums, apricots and pears. The 2010 U.S. Dietary Guidelines for Americans publication includes a discussion about moderate alcohol consumption. “Moderate” alcohol consumption is defined as one serving of alcohol per day for women and two for men. Some studies point to moderate alcohol consumption’s potential to reduce blood pressure and the risk of strokes, gallstones and diabetes. For example, research related to red wine suggests that the benefits may be due to the natural antioxidants, or phenolics, found in grapes. These natural compounds may help prevent “bad cholesterol” (LDL cholesterol) from becoming oxidized and leading to the buildup of plaque in the inner walls of the arteries. However, health experts do not recommend that people begin drinking alcohol or increase their alcohol consumption because of potential health benefits. Moderate alcohol consumption is linked with increased risk of breast cancer, violence, drowning, injuries from falls, and motor vehicle crashes. Excessive alcohol consumption can have serious health consequences ranging from liver failure to death. Alcohol also is a concentrated source of calories and can lead to weight gain. Compared with the same weight of carbohydrate or protein, alcohol has more than 1.5 times the calories. Alcohol provides 7 calories per gram, compared with 4 calories per gram for carbohydrate and protein. Begin with a tested recipe, such as the ones included in this publication. Remember, though, that fruit varies from season to season, so you may need to make adjustments. Before you begin, gather your ingredients and your clean, sanitized equipment. Be sure to measure the ingredients carefully and follow the procedures in the recipe. Remember that at every step, sanitation is critical in preventing wild yeasts and bacteria from spoiling your product. 1. Extract the juice or purchase juice with no preservatives. 2. Ferment the juice, then clarify and stabilize the wine. 3. Bottle the wine and store it properly. Sugar serves as a source of energy for the yeast. The sugar content determines the density of the must (freshly pressed fruit juice). The density of the must is called the “specific gravity” (SG). A hydrometer is used to measure the SG of the must. Pure water has an SG of 1.000 (grams per milliliter). Must has a starting SG of 1.080 (“ten-eighty”) or higher. Finished dry wine can have an SG as low as 0.990 (“nine-ninety”). Depending on the requirements of the recipe, you may need to add sugar to raise the SG prior to beginning fermentation. Yeast is a living organism that consumes sugar and produces alcohol along with carbon dioxide. Many kinds of yeast are available, and they vary in their temperature tolerance, alcohol tolerance, fermentation speed, compactness of the lees (sediment) and, perhaps most importantly, in the aromas they contribute to the wine. Be sure to use winemaking yeast; do not use baking yeast. This component acts as an “energizer” for the yeast and promotes a rapid start to fermentation. It is a food-grade version of the common fertilizers urea and diammonium phosphate. Be sure to follow the recipe recommendations; lack of yeast nutrient can stress the yeast, causing your wine to develop an unpleasant (hydrogen sulfide or rotten egg) odor. This ingredient adds “astringency” or dryness (puckery characteristic) to the wine. Tannin also contributes to the complexity of the wine flavor. In addition, tannins can act as antioxidants to reduce browning of the must and serve as a preservative by binding with spoilage organisms. Most recipes will call for some amount of tannin; however, some fruits have enough natural tannin, so adding more may not be necessary. Be sure to check the recipe before adding tannin. Acid adds “bite” or crispness to wine and eliminates a flat-tasting or flabby end product. Most wine is fairly acidic, with a pH (acidity level) from 3.3 to 3.7; this helps prevent the growth of most types of microorganisms. Acid blend is a mixture of malic, tartaric and citric acid. If you are just starting to make wine, testing for acidity or pH is not necessary; just follow your recipe. However, as your winemaking skills develop, you will want to start testing for the beginning and ending acid levels as well as pH. Most likely you will need to make adjustments to the must by adding various amounts of acid blend. This clarifying agent is a type of clay and often is added during the preparation of the must. 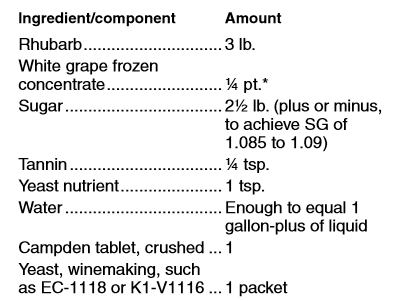 This chemical, in a convenient tablet form, is used to supply sulfur dioxide (SO2) to the must and wine. SO2 acts as a stabilizer to kill or retard spoilage microorganisms. It prevents most “wild” yeasts, mold and bacteria from growing in your wine. It also protects the color and flavor of wines. Wine yeasts are tolerant to moderate levels of SO2. 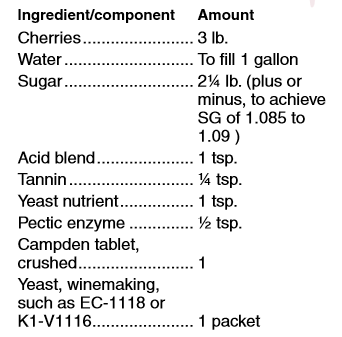 This chemical helps break down pectin and prevents “pectic haze,” or cloudiness, in the resulting wine. This product prevents yeast from multiplying and fermentation from restarting; it should be used if your wine has residual sugar left after fermentation or if you plan to resweeten the wine before bottling. Failure to add potassium sorbate may cause bottles to explode if fermentation restarts. When making wine from grapes, maintaining adequate sulfite levels following the addition of sorbate is important. Otherwise you run the risk of developing a “geranium” aroma if your wine were to spontaneously undergo malo-lactic fermentation. Nylon straining bag: used for straining juice from fruit prior to fermentation. Some recipes call for leaving the fruit in the bag during the fermenting process. Corks: prevent air and contaminants from entering bottles. Always use new corks. Never reuse old corks because they contain microbes and frequently will leak. Everything that touches the juice or wine, including the primary fermenter, measuring containers and stirring spoons, must be washed, rinsed and sanitized. Begin by washing the equipment that will come into contact with any of the wine ingredients with hot, soapy water, and then rinse thoroughly with hot water. Finally, sanitize with potassium metabisulfite (Campden tablets) or sodium metabisulfite prepared according to the manufacturer’s directions. Your end product will be only as good as your starting ingredients. While making bad wine from good ingredients is possible, making good wine from bad ingredients is impossible. The juice from many types of fruits can be used to make wine. Be sure to choose high-quality fruit that is not overripe. The fruit should be free from diseases, blemishes and insect damage. Fruit juice from whole fruit can be expressed with a fruit press, or you can begin with pressed preservative-free fruit juice. Preservatives used in commercial juice may inactivate the yeast and inhibit fermentation. You have various means to extract juice from fruit. Crushing or chopping the fruit and then straining and pressing it through a mesh bag or cheesecloth is a common means for extracting juice. You also can use juicer machines and steam juicers. When crushing or chopping the fruit, take care not to break the pits from stone fruits such as cherries or plums. These pits contain a cyanide-forming compound that will add a bitter taste to the wine. Note: Freezing and then thawing softens many kinds of fruit and helps with juice extraction. Avoid heating fruit because the heat may cause too much pectin to be released. Heating can cause a pectic haze in the wine; however, steam juicers can be an alternative means for extracting juice. 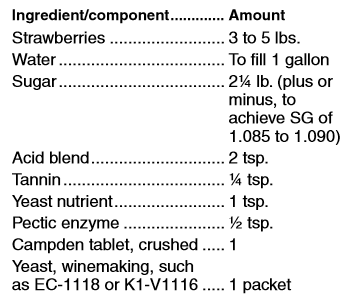 Many recipes call for 3 to 5 pounds of fruit per gallon of wine, with added water making up the rest of the volume. Grapes are an exception because the juice usually is used full strength with no water added. Prepare the must in your cleaned and sanitized primary fermenter. Many kinds of vessels can be used for primary fermenters, but they must be made of food-grade materials. During juice preparation, add the recipe ingredients such as tannin, acid blend and yeast nutrients. Do not add the yeast at this time. If the juice has been prepared from fresh fruit, plan to add potassium metabisulfite at the rate of 50 parts per million of SO2 (or one Campden tablet per gallon) to neutralize any wild yeast or bacteria. 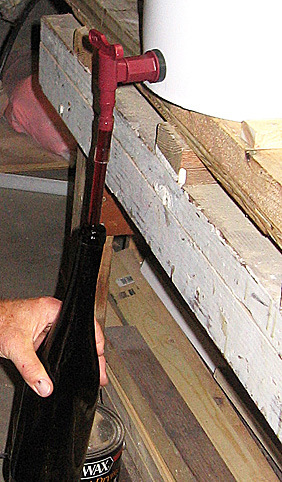 Take an initial specific gravity reading with your hydrometer and record it on your winemaking record sheet. If the specific gravity reading is lower than what the recipe calls for, add and thoroughly mix additional sugar and then recheck the specific gravity. Add small amounts of sugar at a time to keep the SG from going higher than the recommended level. 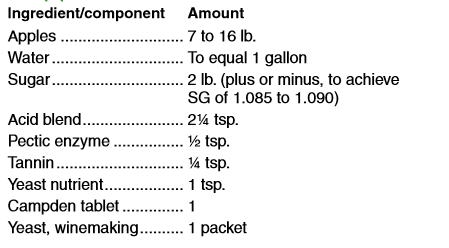 Eleven grams of sugar per liter of must will raise the SG by 0.004 (or by 1 unit on the Brix scale). 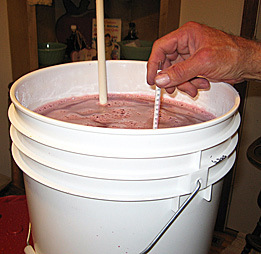 Wait about 24 hours before adding winemaking yeast to the prepared juice. 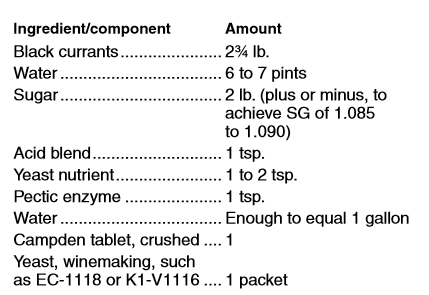 Follow the manufacturer’s recommendations for rehydrating the wine yeast and then add it to the must. You may choose to use a sealed fermenter with an airlock or you can place a clean cloth over the fermenter for the first few days of the fermentation. Keeping out any fruit flies is very important because they can transmit vinegar-producing bacteria to your wine. Temperature is important; try to keep the must maintained at an even temperature between 65 and 80 F. Fermentation at a higher temperature will be quicker and is used for red wines. Cooler temperature fermentation is slower but allows the retention of more of the delicate, fruity aromas in white wines and fruit wines. Once a vigorous fermentation has begun at a warmer temperature, the must can be moved to a cooler area if desired. As the juice starts to ferment, you will notice bubbles forming at the surface; this is normal and indicates that the yeast cells are consuming the sugar. Monitor the specific gravity and when it reaches a level of about 1.020 to 1.030, move the wine into a secondary fermenter, commonly called a carboy. 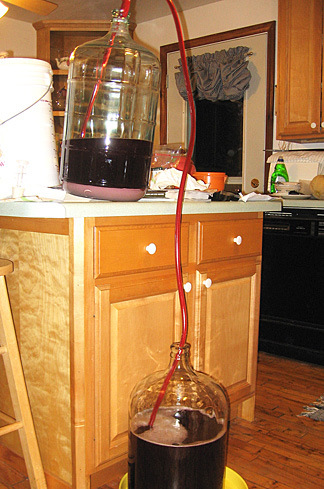 Using a racking cane and siphoning tube, rack (siphon) the wine from the primary fermenter into the carboy; try to keep from transferring much of the sediment at the bottom of the fermenter. 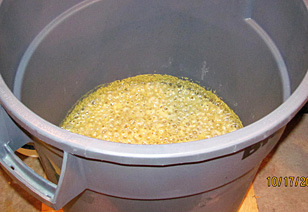 At this stage of fermentation, do not fill above the shoulders of the carboy to allow for expansion during the remaining fermentation. Use an airlock partially filled with water to allow the carbon dioxide to escape and to keep air out. Regularly check the specific gravity. When you no longer see any apparent fermentation activity (bubbles) and the SG appears to be around 0.95 to 0.98, the wine is fully fermented. After fermentation is complete, filling the carboy to within a few inches of the airlock is important; this prevents too much exposure to oxygen. For the next several weeks or months, additional racking from one container to another will be needed to remove the wine from the lees (sediment). Each of these rackings will require that the carboy be filled to about an inch or two below the rubber stopper of the airlock. Clarification can be hastened by using one of several different additives. Do not use more than one clarifying agent at a time, and allow ample time for the clarifier to work; this may take several days to several weeks. Plan to add additional Campden tablets or SO2 (follow the recipe instructions) at every other racking to protect your wine from too much oxygen exposure and spoilage organisms. Filtering your wine is an optional means to aid in clarifying it. Several filters are available at varying costs. Filtering can remove some of the color and flavor, but it generally is beneficial because it results in less cloudiness and less sediment in the bottle if the wine is stored for a long time. Bottling and storage is the final step and should be done only when the wine has been racked off any remaining sediment and has achieved good clarity. Patience is important during this step; bottling before the wine is fully stabilized may cause sediment to form in the bottles as they age. Always use new corks. Be sure the corks are the correct size for the bottle opening. No. 9 corks will fit most U.S-manufactured bottles, but you may need No. 8 corks for smaller-necked bottles from other countries. After bottling, stand the bottles in an upright position for a few days to allow the cork to thoroughly expand, and then store the bottles on their sides until ready to use. Wilker, Karl L., Tavis S. Harris, Marilyn B. Odneal and Murli R. Dharmadhikari. Making Wine for Home Use. Mountain Grove, Mo. : Southwest Missouri State. Using a bottle brush, scrub the inside of the bottle with dishwashing detergent, then thoroughly rinse. Just prior to bottling, rinse the bottle with a “no-rinse” sanitizing agent, then allow the bottle to drain before filling with wine. Never use bleach or antibacterial soaps containing triclosan when cleaning bottles. A bottle of wine looks finished and more attractive with a label. You can buy preprinted labels or make your own using a computer and printer. To keep the label ink from fading and blurring, lightly spray a fixative, such as hair spray or a clear acrylic gloss, over the label. Although wine bottles can be reused, corks never should be reused. Technically, wine is ready for consumption at bottling time, but it improves with aging. After bottling, wine undergoes a temporary change called “bottle shock,” which can last for three weeks or more; experts believe it may be due to the agitation during bottling or the exposure to oxygen. Therefore, wine should be aged for at least two months, but one year of storage prior to consumption is better. Store wine bottles on their sides in a cool, dark place. This helps prevent the cork from drying out and shrinking, and prevents oxidation/color changes from prolonged light exposure. In a one-person household, federal regulations limit yearly production to 100 gallons (about 500 bottles). If two or more adults live in the household, yearly production is limited to 200 gallons (about 1,000 bottles). o Begin by pouring the wine into a clear wine glass. Try to use a white tablecloth or napkin under the glass so you can examine the color. Describe the color. Is it clear, pale yellow or gold? Ruby red, dark red or brick red? Next, consider the clarity. Is it cloudy or clear? Do you see sediment? o Use your sense of smell to determine the aroma. Swirl the glass for about 10 seconds, then inhale. Does it have a floral aroma? Is it fruity? Is the aroma different than before you swirled it? o Taste the wine. Take a sip and let it roll around your mouth. Attack phase: What is your first impression? You may taste alcohol, the astringency of the tannins, acidity or sweetness from the sugar. Is it well-balanced or does one of those characteristics dominate the others? Evolution phase: During this phase, you discern the flavor profile of the wine. Do you detect notes of berry, apple? The finish: This is the flavor impression after the wine is swallowed. Was it “light-bodied” (similar to water), “medium-bodied” (similar in mouth feel to milk) or “full-bodied” (similar to cream)? Was it sweet or bitter? How long did the taste last? Remember that winemaking is a science and an art. You may find that you have to make adjustments in your procedures due to differences in the fruit. Use only ripe, insect- and disease-free fruit. Bruises may be cut out. Quarter, remove stems and seeds, then chop the fruit into small pieces. Crush the pulp, then press the juice into your primary fermenter through cheesecloth or a straining bag. Using the minimum amount of fruit will produce a light-flavored wine. Adding the maximum amount of fruit will yield a fuller-bodied wine. To prevent oxidation, add the crushed Campden tablet to the juice as soon as possible. Add water to equal 1 gallon. Mix in all other ingredients except the yeast. With a hydrometer, measure and record the specific gravity of the juice. Cover the primary fermenter and allow the juice to set for 24 hours. After the 24 hours have passed, sprinkle the yeast over the surface of the juice. Seal the primary fermenter and add an airlock, or if desired, you may cover the primary fermenter with a clean cloth. After fermentation starts, keep track of the specific gravity. Transfer (siphon/rack) the wine to a carboy when the specific gravity has decreased to 1.010 to 1.020; be sure to add an airlock to the carboy. Fermentation may take three to four weeks to complete. Measure the specific gravity and when it has reached .95 to .98, the fermentation is complete. Rack the wine to a clean carboy and allow it to settle for an additional eight to 12 weeks. Be sure to top up the carboy after each racking with water or a similar wine. Sanitized marbles can be placed in the carboy in lieu of topping up. After the wine has sufficiently cleared, it’s ready for bottling and corking. Try to avoid tasting for at least six weeks. Pull off stems and leaves, wash and sort out damaged fruit. 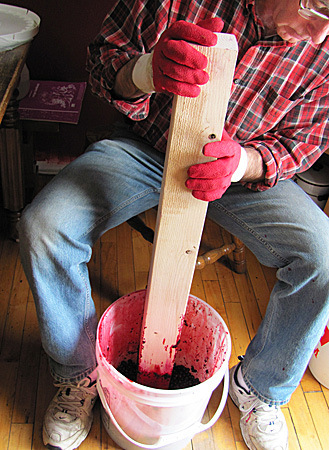 Place currents in a food-grade pail, then using a heavy, sanitized piece of hardwood such as oak, mash the fruit. Separate the pulp from the juice using a nylon straining bag. Save the pulp for later use. Add all ingredients except the yeast to the juice and measure the specific gravity with a hydrometer. Gradually add sugar to reach a specific gravity of 1.090 to 1.095. Add the pulp to the must and cover the primary fermenter with a clean cloth. Set the prepared juice aside for 24 hours. Check the specific gravity again, making sure it’s in the necessary range. Prepare and add the yeast as per the manufacturer’s directions. Primary Fermentation: Daily check the specific gravity beginning after the first three days. Secondary Fermentation: When the SG has reached approximately 1.020 to 1.030, rack the wine into a glass secondary fermenter and attach an airlock. Be sure not to fill the secondary fermenter past the shoulders of the container. Keep the temperature of the room at a minimum of 65 degrees and a maximum of 80 degrees. Monitor the secondary fermentation, and after the airlock bubbling begins to slow down, check the specific gravity. When the SG reads .95 to .98, the fermentation is complete and the clearing process can begin. Rack the wine to another glass carboy, making sure to leave as much of the sediment behind as possible. Add clearing agents and top off the carboy with a similar wine or add water to within 2 inches of the bottom of the airlock. In about three weeks if sufficient clearing has taken place, rack the wine again to another glass carboy and allow it to settle for another two to three weeks. If no more settling takes place and if the wine is clear, it’s ready for bottling. Wash and sort the cherries. Remove stems, leaves and any diseased, overripe or insect-infested fruit. Pitting the cherries makes them easier to crush. If you choose not to pit the fruit, be sure not to break the pits when crushing the cherries. Using cheesecloth or a nylon straining bag, squeeze the juice into the fermenter. If you desire a full-flavored wine, tie the straining bag and leave the pulp in the fermenter. Add all ingredients except the yeast. Let the must stand for 24 hours, then add the yeast and cover the primary fermenter. In three to five days, measure the specific gravity, and when it has decreased to 1.020 to 1.030, remove the straining bag and squeeze the wine from the pulp. Move the wine into the carboy (secondary) fermenter and attach an airlock. Allow the wine to continue fermenting at a temperature of at least 68 F; do not exceed 80 degrees. When the specific gravity has decreased to .95 to .98, the fermentation is over. Now you can clear the wine by using clearing agents such as kieselsol and chitosan, or you can allow the wine to clear naturally during several months. When the wine is perfectly clear, it is ready for bottling. *Be sure the frozen concentrate contains no preservatives. Wash rhubarb, chop into small pieces and freeze for several days. Thaw the rhubarb, place it in a nylon straining bag, then mash and squeeze the juice into a primary fermenter. Leave the pulp in the straining bag and add it to the fermenter. Add all other ingredients except the yeast and stir the must thoroughly. Measure the SG and, if needed, add sugar to reach 1.095. Cover the fermenter loosely with its lid or cover with a clean towel and allow the juice to set for 24 hours. Add the yeast and keep the must at a temperature of 68 to 75 F.
Check the SG in three to five days; if it has reached 1.030 to 1.040, rack the wine to a secondary fermenter and add an airlock. Be sure to leave plenty of head space so the active fermentation does not push wine out the top of the secondary fermenter. Check the SG in about three weeks and if it has reached .95 to .98, the fermentation is over. Rack into another secondary fermenter, being careful to leave the sediment behind. Add clearing agents and top up the carboy with water or a white wine; leave about 2 inches of head space and add an airlock. Wait at least two weeks and if the wine is sufficiently clear, rack again to another carboy. Try not to disturb the sediment when racking. At this point, the wine can be bottled or allowed to continue clearing and settling for several more weeks. Additional aging in a carboy usually will lead to a more esthetically appealing wine. Gently rinse and then crush the strawberries. Place the crushed fruit in a nylon straining bag. Add all of the ingredients except the yeast, including water to make 1 gallon, and then mix well. With your hydrometer, measure the specific gravity and, if needed, add sugar to reach 1.085 to 1.095. Cover the fermenter loosely with its lid or cover with a clean towel and allow the juice to set for 24 hours. Next add the yeast and keep the must at a temperature of 68 to 75 F. Check the SG in three to five days; if it has reached 1.030 to 1.040, rack the wine to a secondary fermenter and add an airlock. Be sure to leave plenty of head space so the active fermentation does not push wine out the top of the secondary fermenter. Check the SG in about three weeks, and if it has reached .95 to .98, the fermentation is over. Rack into another secondary fermenter, being careful to leave the sediment behind. Add clearing agents and top up the carboy with water or a white wine; leave about 2 inches of head space and add an airlock. Wait at least two weeks, and if the wine is sufficiently clear, rack again to another carboy. Try not to disturb the sediment when racking. At this point, the wine can be bottled or allowed to continue clearing and settling for several more weeks. This wine will continue to improve for about a year. American Wine Society. (1993). The Complete Handbook of Winemaking. Ann Arbor, Mich.: G.W. Kent Inc.
Cooke, George M., and James T. Lapsley. (1988). 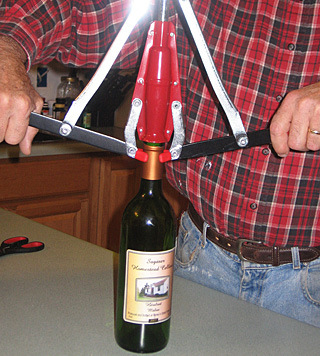 Electronic Version, Butzke, Christian E. Making Table Wine at Home. Cooperative Extension Enologist Department of Viticulture & Enology, UC Davis, Calif.
Crowe, Alison. (2007). The Wine Maker’s Answer Book. China: Regent Publishing Services. Iverson, Jon. (2009). 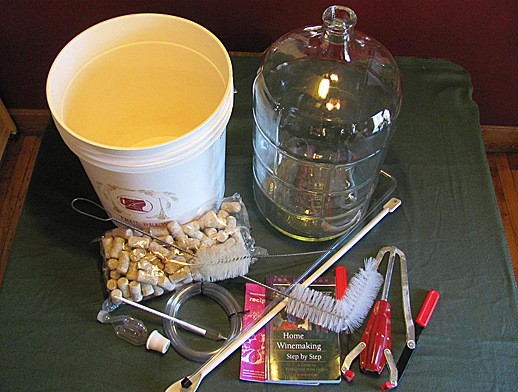 Home Winemaking Step by Step. Medford, Ore.: Stonemark Publishing Co.
Keller, J. The Winemaking Home Page. Massaccesi, Raymond (1976). Winemaker’s Recipe Handbook. Plocher, Tom, and Bob Parke. (2008). Northern Winework 2nd Edition. Eau Claire, Wis.: Eau Claire Printing Co.